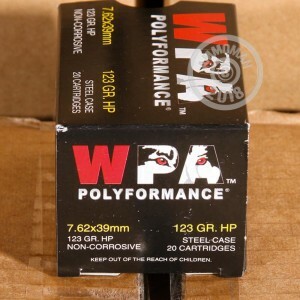 If you're a bargain hunter in more ways than one, you'll appreciate the efficiency of this hollow point 7.62x39 ammunition from Wolf. 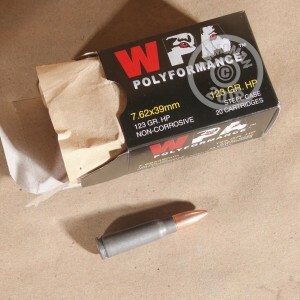 These Russian-made cartridges fire a 123 grain bimetal jacketed hollow point bullet that works great for both hunting and target shooting. 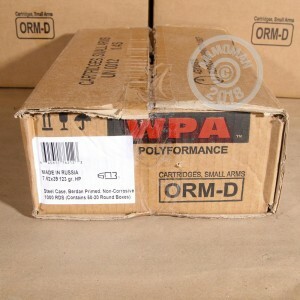 This ammunition comes in boxes of 20 and uses non-corrosive Berdan primers and steel cases with polymer coatings designed to ensure reliable cycling. Pick up more than $99 worth of products at AmmoMan.com to qualify for free shipping! At these prices, that's a lot of bullets!